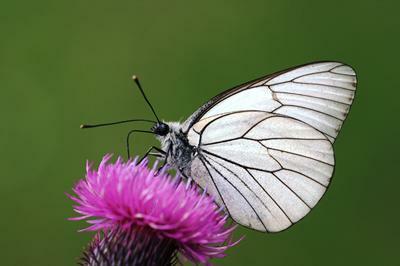 The Black-veined White butterfly could make a return to the UK after becoming extinct in the 1920s. The UK’s changing climate means conditions may now be suitable for one of Sir Winston Churchill’s favourite butterflies - the Black-veined White - to return, a study has revealed. Climate change poses a huge threat for many of the UK species of butterfly but could provide the large and striking Black-veined White with an opportunity. The butterfly became extinct in the UK in the mid-1920s after once being found across parts of southern England. It is thought that one of the reasons behind the butterfly’s extinction in the UK was a period of climatic unsuitability including a series of wet autumns. But studies have now revealed that with climate change over recent decades, average climate conditions may be suitable for the Black-veined White in the UK once again, especially in the warmer parts of southern and eastern England. Two recent studies in climatically similar parts of northern France found that the Black-veined White’s habitat requirements would be easy to recreate by creating field margins rich in nectar sources with a supply of regenerating scrub. The results of the studies were revealed at Butterfly Conservation’s International Symposium held recently at the University of Southampton. Fabrizia Ratto, a postgraduate research student in Environmental Biosciences at Southampton who conducted one of the studies on behalf of Butterfly Conservation explained: “Our study found that the butterfly has a strong preference for small isolated bushes of Blackthorn and Hawthorn as egg laying sites with abundant nectar sources such as Red Clover nearby. “These habitat conditions can be recreated relatively easily in the UK through the implementation of agri-environmental measures such as nectar flower mixes in crop margins and by allowing some scrub regeneration beside adjacent hedgerows,” Fabrizia continued. The Black-veined White was much-loved by former Prime Minister and butterfly enthusiast Churchill who attempted to release hundreds in the grounds of his Chartwell home in Kent in the mid-1940s, a practice that would be frowned upon today. Churchill is believed to have become interested in butterflies while a young officer stationed in India. His plans to release the Black-veined White were thwarted by his gardener who accidentally cut the nests of the young caterpillars from the Hawthorn bushes where they had carefully been placed. Professor Tom Brereton, Associate Director of Monitoring at Butterfly Conservation, who supervised the research said: “We have so few butterflies in the UK, the return of one of Europe’s most spectacular species would be a major boost for everyone who loves butterflies. Although average climatic conditions now appear suitable for the Black-veined White it is not known if the butterfly could withstand the increased frequency of extreme events which is also a feature of our changing climate. More research is needed in this area. Dr Nigel Bourn, BC Director of Conservation Science, said: "This fascinating research is just one of several climate change related papers at the Symposium that are highlighting that while climate change is likely to be a disaster for much of our wildlife, that impact can be reduced by positive action that we can take." I am a Postgraduate Research Student within Biological Sciences at the University of Southampton and have been an ecologist since the beginning of my undergraduate degree. In between studies I have covered various ecologist roles for local authorities both in Italy and the UK.